Bradley Goldberg’s penalty was enough to end Welling United’s four month away match winless run with an excellent win at Oxford City. Manager Steve King went for a very attacking formation and with a bit more luck the score-line would have been far more emphatic. Dan Wilks was busy in the first fifteen minutes but after that it was pretty much one way traffic. He made two saves from Kabongo Tshimanga, one of which was outstanding, and two good stops from Brandon Thomas-Asante. However, that spell was over, Welling came into the game and their quick crisp passing had the hosts chasing shadows. On twenty minutes. Danny Mills tusseled with Eddie Jones in the penalty area and the Oxford full back brought him down. There was little argument from the Oxford players and Goldberg stepped up to slam home the spot kick. Craig King made a good save from Montel Agyemang after good work by the tireless Jack Barham and Mills. Soon after King was again in action tipping over a Craig Braham-Barrett near post cross before Mills headed the last chance of the half over from Agyemang’s corner. How Welling didn’t give themselves breathing space after the interval is a mystery. 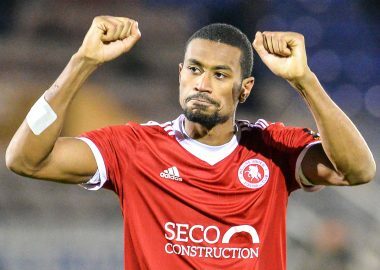 Anthony Acheampong, who had scored the winner when the teams met earlier in the season, had a header cleared off the line before Welling came close in their next three forays. Barham showed his skill as well as his endeavour to create an opening for himself but his twenty yard effort flew back off the woodwork. Then Goldberg flicked on an Agyemang free kick but was aghast to see it came back off the inside of the post. Reece Fleet tried his luck from distance but Wilks was right behind it before Barham came close for Welling with a low drive that was touched just beyond the far post although the referee awarded a goal kick. 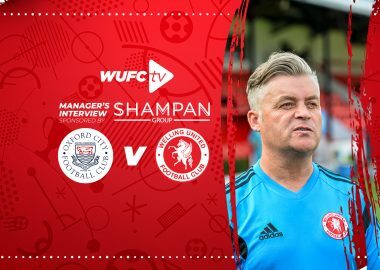 In injury the referee took a dislike to a comment from the Welling bench and sent the Welling manager to the changing rooms.